Welcome to the practice of Dr. Terry L. Griffin D.M.D. 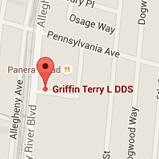 Thank you for choosing the dental office of Dr. Terry L. Griffin D.M.D. We would like to welcome you to our web site; and we invite you to take a look around and find out what makes our patients smile! Dr. Griffin and his staff provide patients with top quality dental care in a warm, family-friendly environment. Patients are treated with kindness and respect and can count on all their questions being answered. Dr. Griffin specializes in family and cosmetic dentistry, root canals, extractions, dental implants, and is Lumineers® certified. Residents of Oakmont, Allegheny, Pittsburgh, and surrounding areas trust Dr. Griffin and his staff to provide a comfortable, pleasant experience during each dental visit.